Swap Meet Sat May 19th (possibly our last!) Be there or be square! Hey all we're doing one last swap meet. It's going to be the biggest and the best one ever! So be there or be square. Come sell all your junk! And come buy all the sweet great deals on used parts and accessories and hell even bikes! 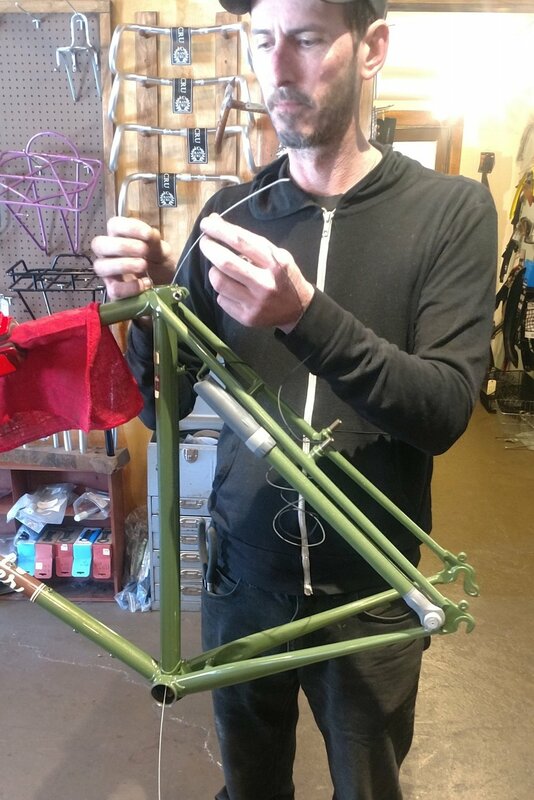 Norther Cycles and PCC Cascade Bike Shed invite you to a Swap Meet! What are swap meets? Swap meets are events like flea markets, where lots of people get together and have a group garage sale all in one place. 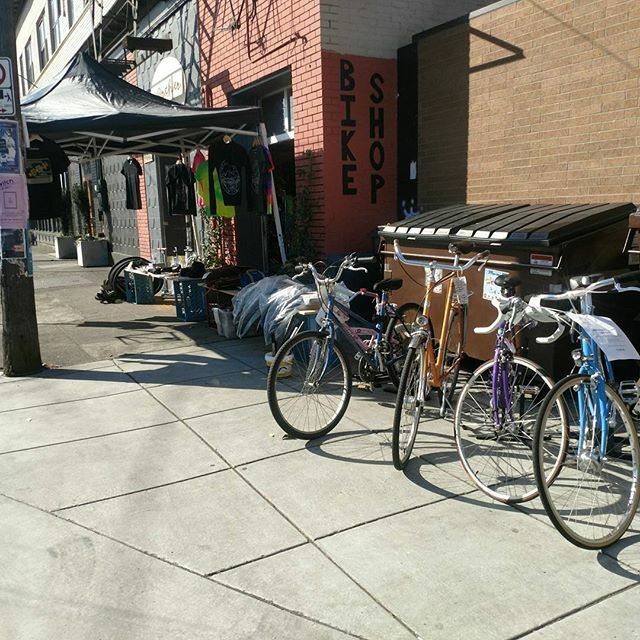 A bike swap meet is just like that except with bikes, bike parts, and bike accessories! So if you have a pile of old bike stuff, or an old bike or three bring them down and sell them! Or if you're in need or interested in a new to you bike or in need of some bike gear come on down. There's always lots of people selling lots of great new and used stuff. The Portland Community College Cascade Campus outdoor Quad located right next to Norther Cycles just north of N Killingsworth St on N Albina Ave.
Swap meet will happen rain or shine, so if you plan on selling stuff bring your pop tent if you have one, and tables or tarps to lay out your parts. No size restrictions on seller's spaces, so bring all your stuff! The swap meet is for selling bikes, parts, and related items. You can bring other stuff too if you like, but it's really a bike stuff swap. No reservations, there's more than enough room for everyone. No need to pre-pay, you can pay the day of. In fact you can pay after you sell some stuff! 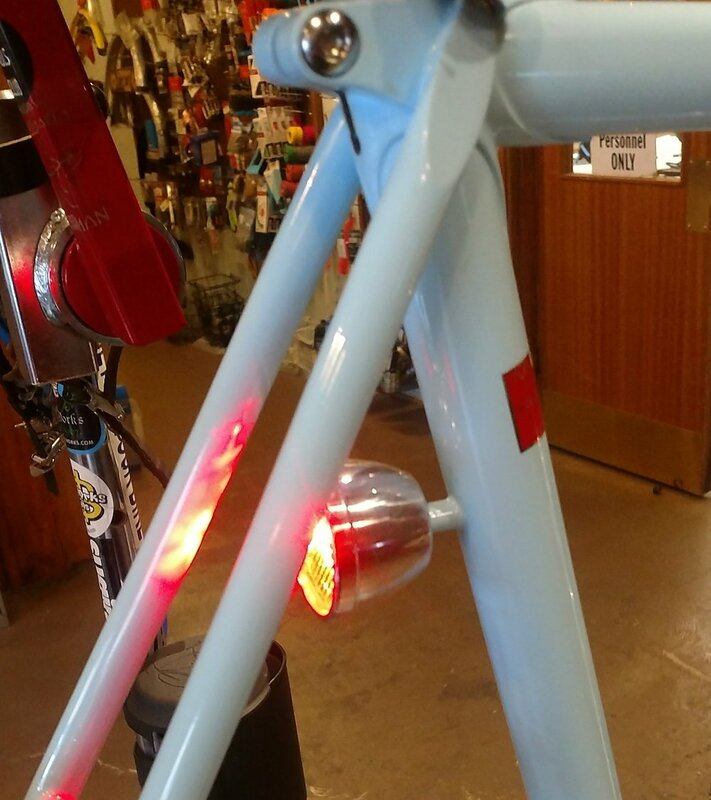 The Compass Cycles dynamo tail light has become almost standard on custom bikes, and for good reason. 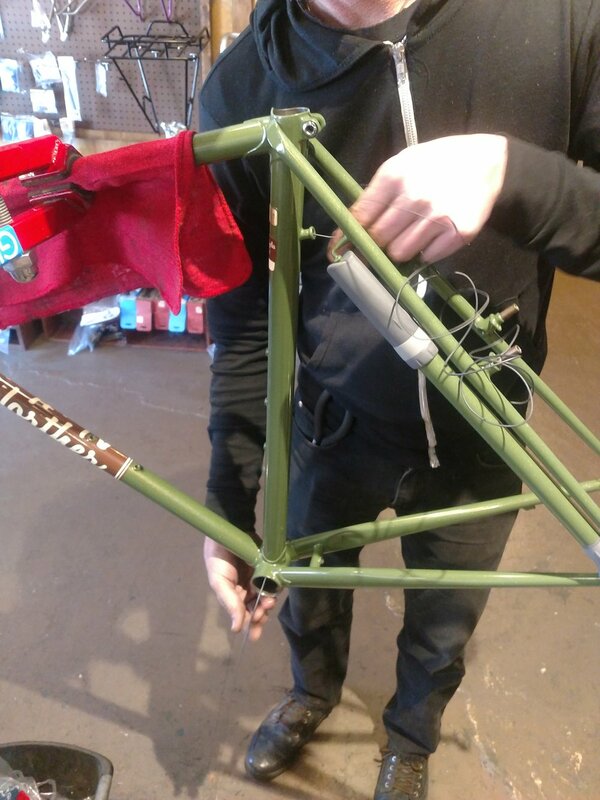 There are very few bikes we can even imagine building without one. It’s light, sleek, and tucked away in the safest spot on a bike. 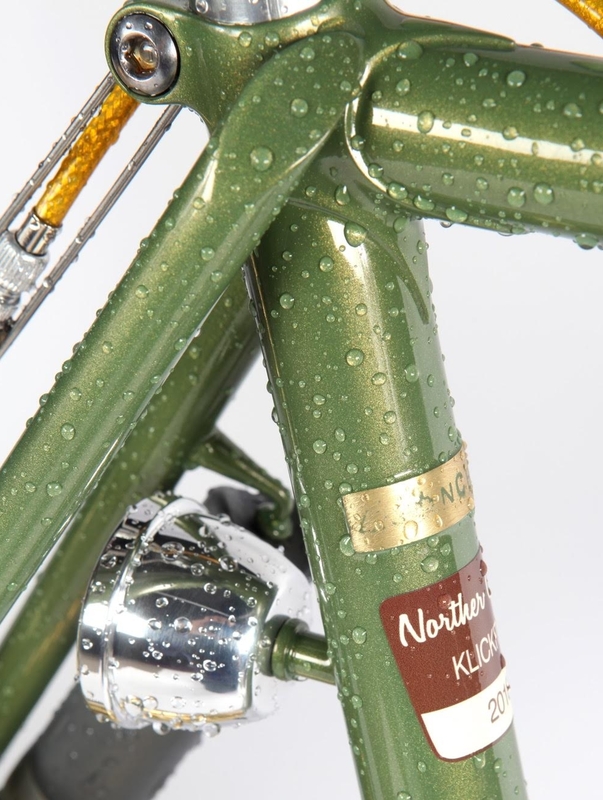 We recommend them over all other tail lights and build many bikes with them, and have added the special braze on to many existing steel frames. You will need a few tools and supplies the light doesn’t come with. 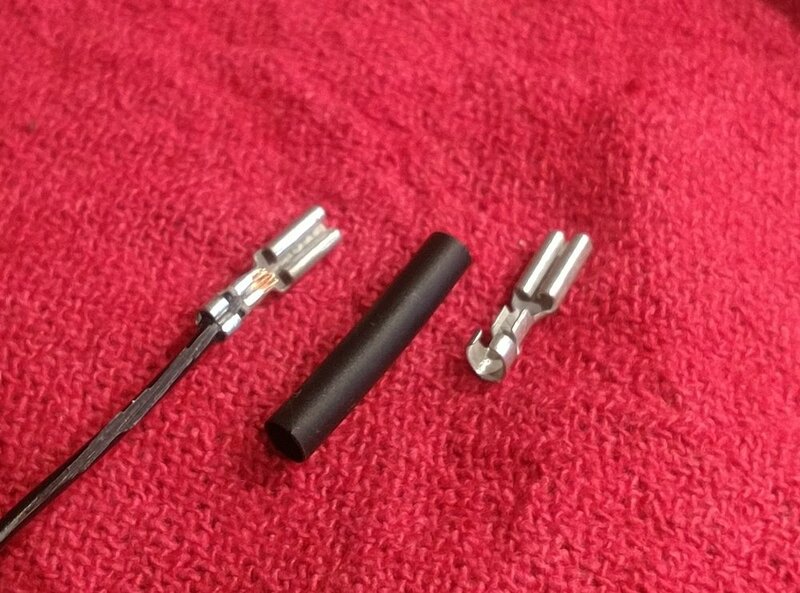 I used two female and one male Connector from B&M, as they are the most common, and at least five short lengths of small heat shrink. You’ll need a Knipex Crimper an old brake cable, small gauge wire stripping pliers, long needle nose pliers, and a lighter. A clean rag and some rubbing alcohol will make your life a lot easier too! 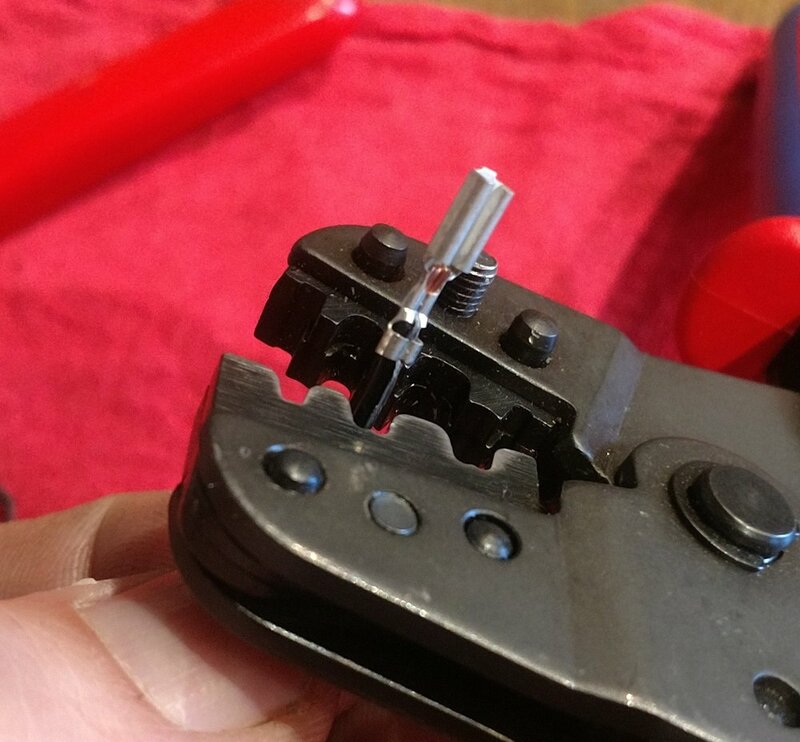 With the exception of the connectors and Knipex Crimper for crimping them the tools and supplies are all very common and can be had at any hardware or tool store. We can get the Knipex Crimper pliers and connectors for you or you can order them directly from Peter White Cycles.1. 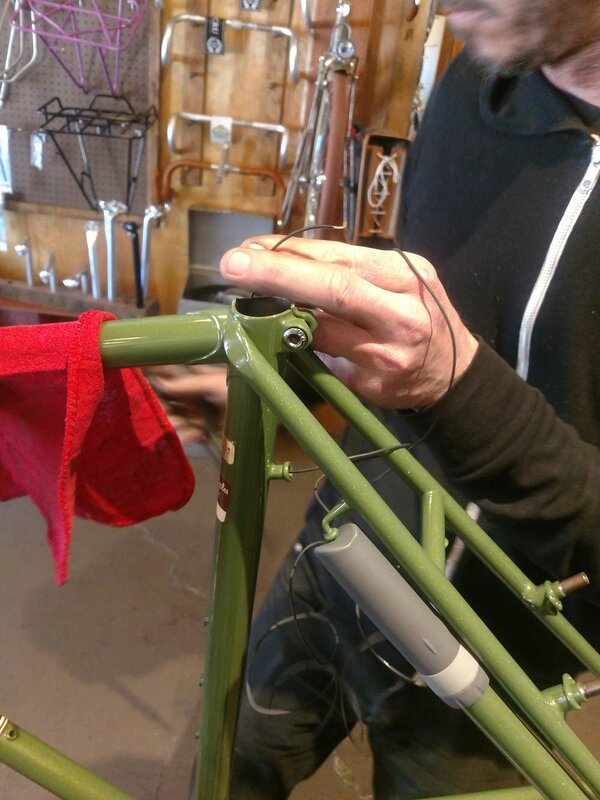 You will need to get several inches of wire into the braze-on. 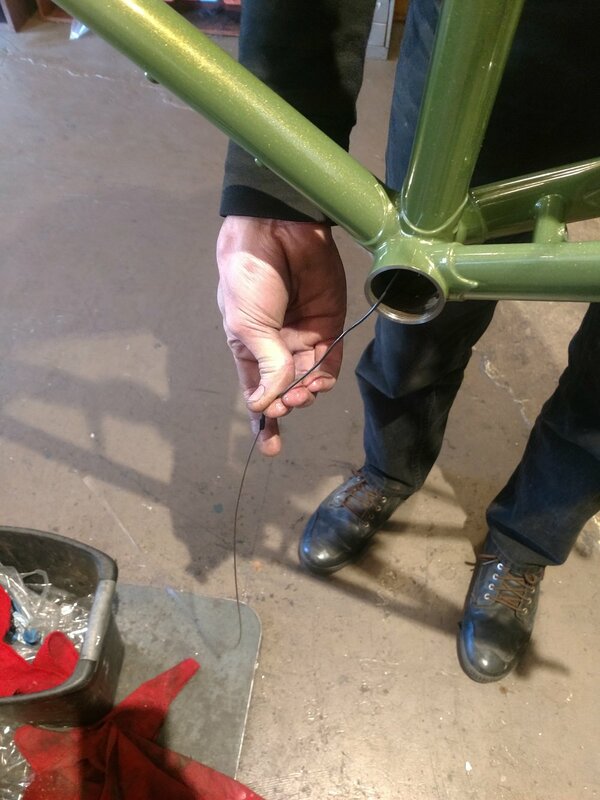 Use a long set of needle nose pliers to carefully grab the end of the wire and fish it up through the seat post opening.2. Drop one end of the cable down the seat tube from the seat post hole down to the bottom bracket shell. Leave plenty of the cable still poking up out the top of the seat tube. 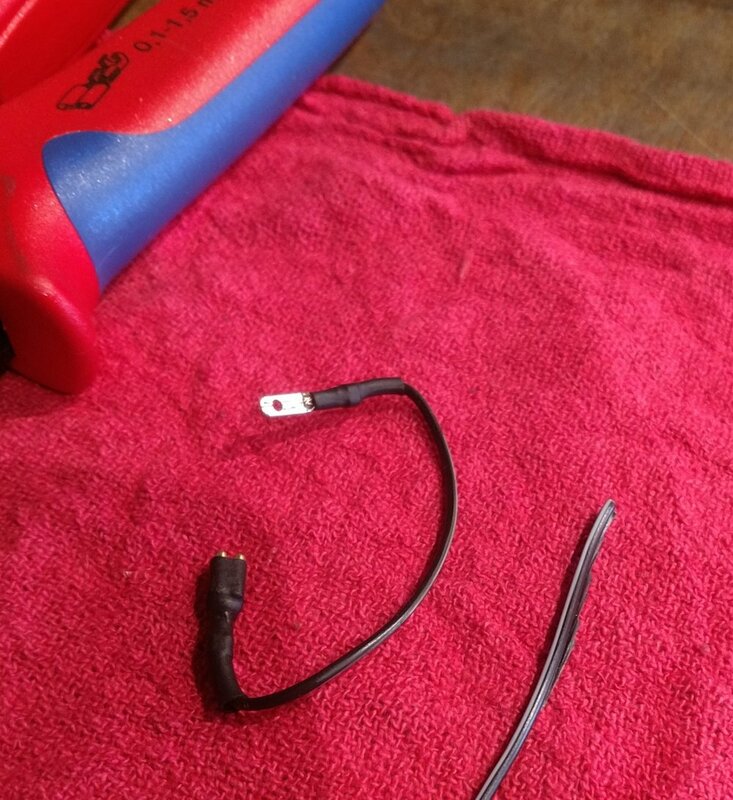 Attach the taillight wire to the brake cable with a piece of heat shrink by Putting the heat shrink over the brake cable, and inserting the taillight wire most, but not all of the way through the heat shrink. Use a lighter on the heat shrink to make it shrink nice and tight.3. 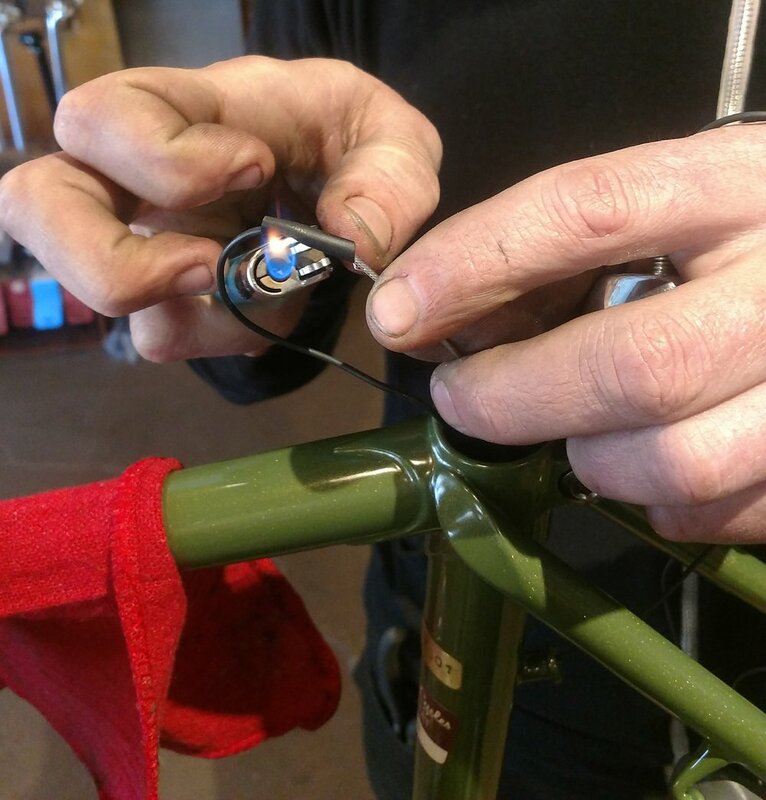 Use one hand to slowly and carefully guide the rest of the taillight wire into the braze-on and the other hand to slowly and carefully pull the other end out through the bb shell. Once the full wire is fed into the braze-on you can screw the light in. Add a little grease to the threads of the taillight. There are no wrench flats and the taillight. It has to be fully threaded in and tightened by hand. Resist the urge to try and tighten it with pliers or other tools. Make sure the wire spins freely and doesn’t bind up while tightening the light.4. Separate the taillight wire and the cable and remove the old heat shrink. 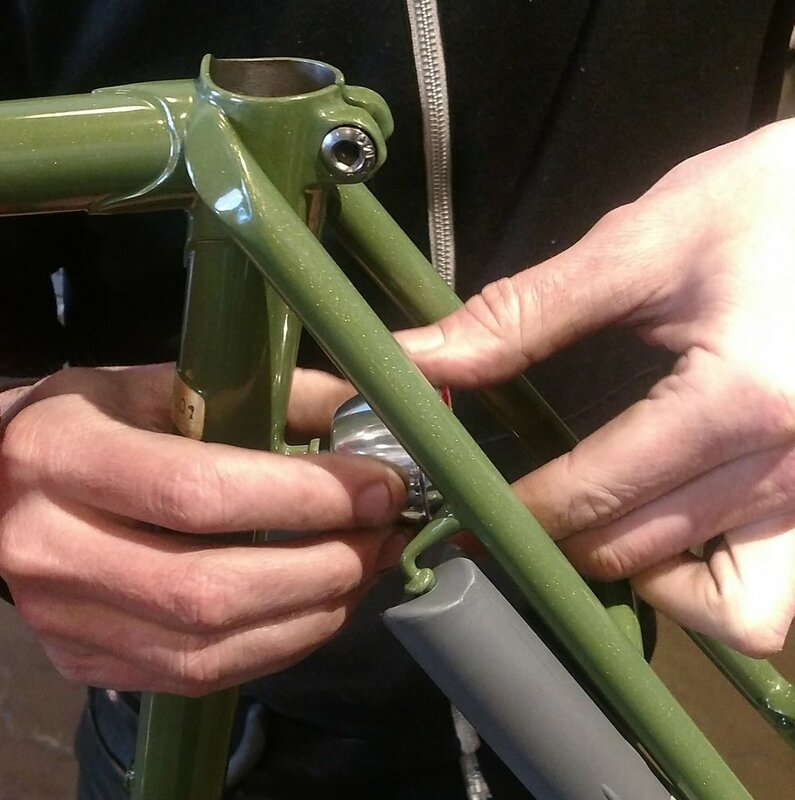 On our frames we have a small reinforced hole by the lower head lug. This is the exit for the tail light wire. 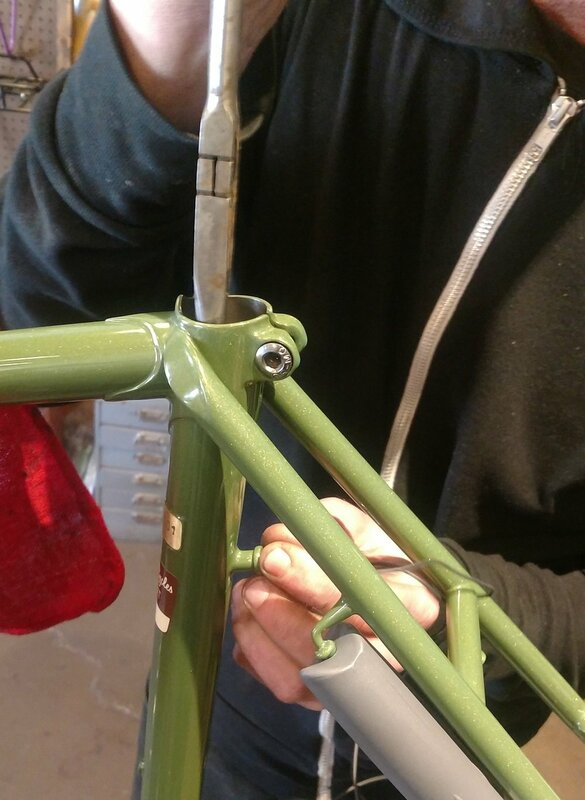 Many other builders do something similar on their frames. If you frame is different you will need to figure out how the wire exits and change these steps accordingly. Locate this small exit hole and feed the brake cable in and down to the open bb shell. Pull it part way out of the bb shell making sure it’s still poking out of the exit hole. Heat shrink the cable and wire together just like last time. Then carefully pull the cable back out through the small exit hole. 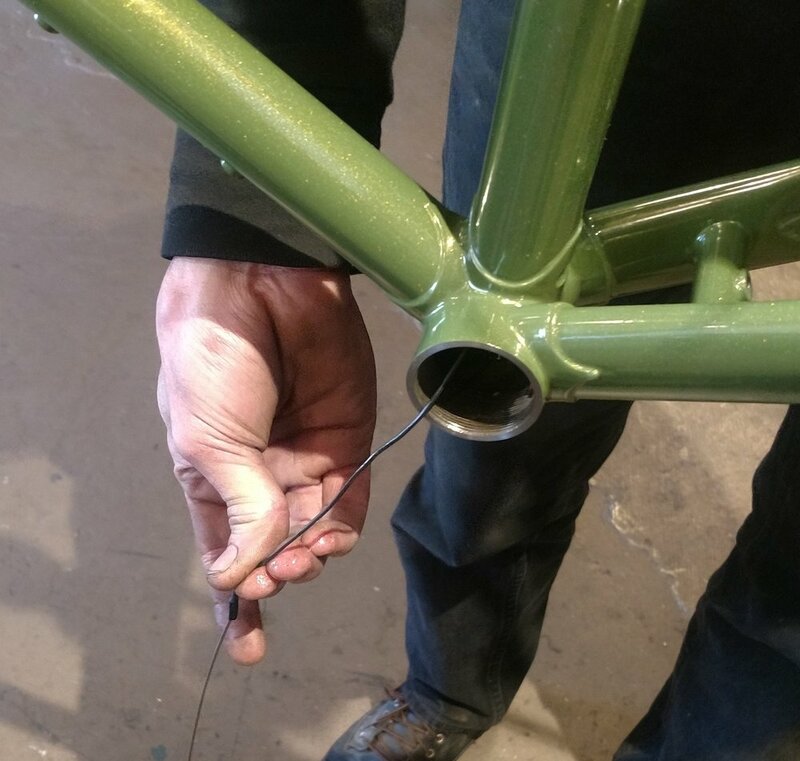 Again use your other hand to guild and feed the wire into the bb shell and up the down tube. Here’s the tricky part. The small exit is very small and tight and heat shrink joint is very thick. 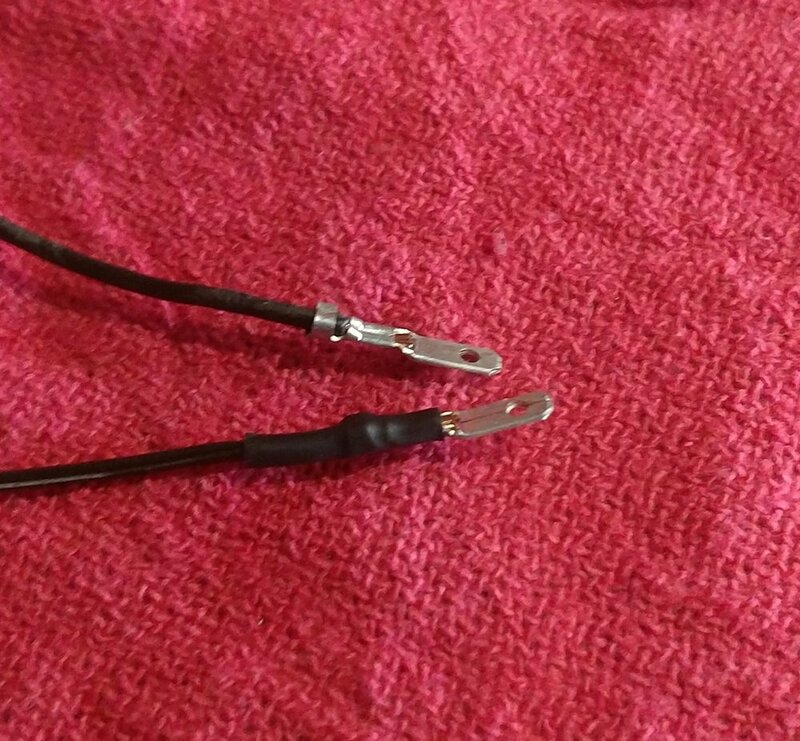 It’s especially important that the wire doesn’t poke out the other side of the heat shrink here. You will need to carefully twist and wiggle the cable to get the heat shrink to start to pull through the hole. If it binds up here and you pull to hard the wire will pull out of the heat shrink and you will have to pull it back through the bb shell and start over again. Once the tip of the heat shrink is through the hole pinch it with your fingers and pull and wiggle it directly to avoid losing the wire. Delicately pull it all the way through, while feeding it with your other hand. You don’t want any more wire than you need hanging out in the bb shell as you can catch it while installing the bb and damage or break it. Not fun. 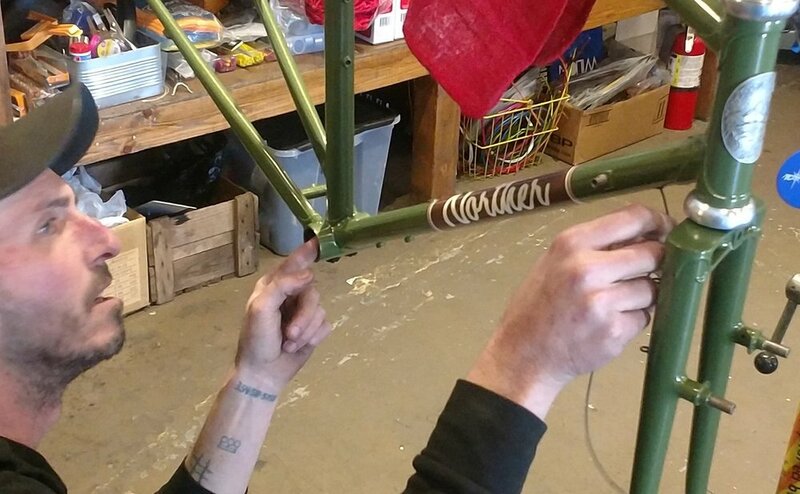 Now the wire is fished through the frame but you just have a few feet of wire dangling from a hole in your down tube. At this point you can run it to the headlight anyway you like, but if you want the job done smartly here’s what we recommend.5. 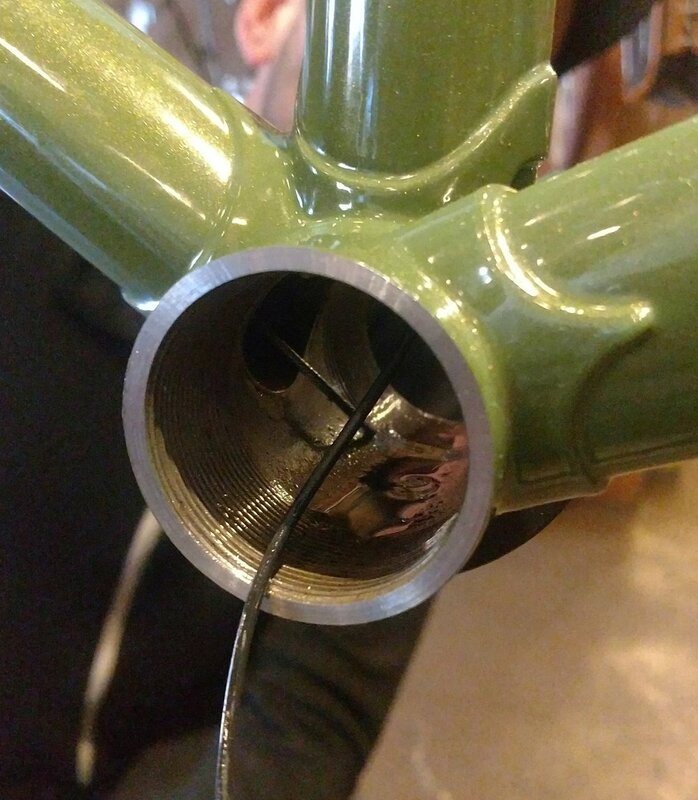 I like to cut the wire about six inches or so from where it exits the down tube. Then use some wire stripping pliers to strip a small section, about 5mm, of the plastic housing from the wire. 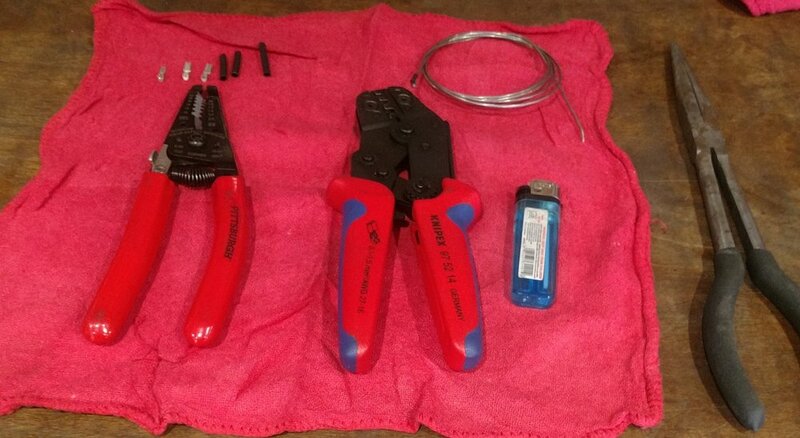 Then attach a connector with the Knipex Crimper pliers.1. The connectors need to pinch to the wire in two places the outer tangs of the connector should pinch down on the plastic housing of the wire. The smaller inner tangs should pinch down on the exposed wire. 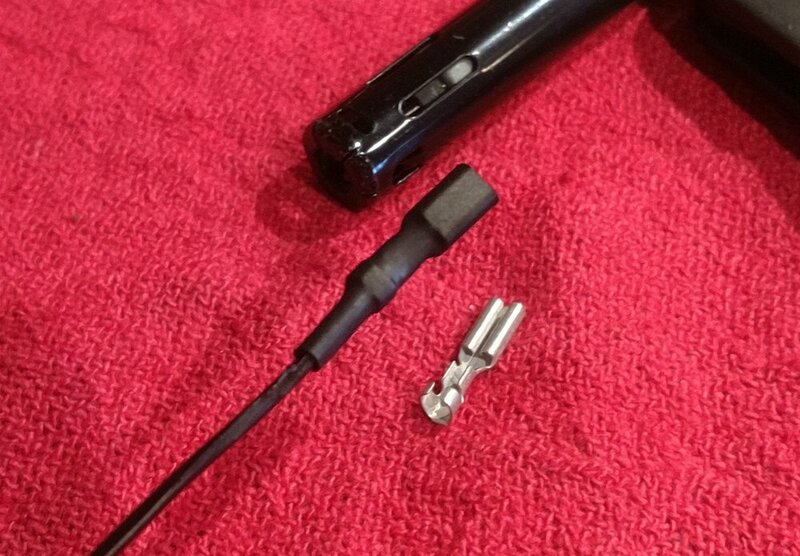 We prefer to use the female connector first as it is bigger and less likely to fall back into the down tube through the exit hole! Once attached and covered in heat shrink we like to add a pig tail. 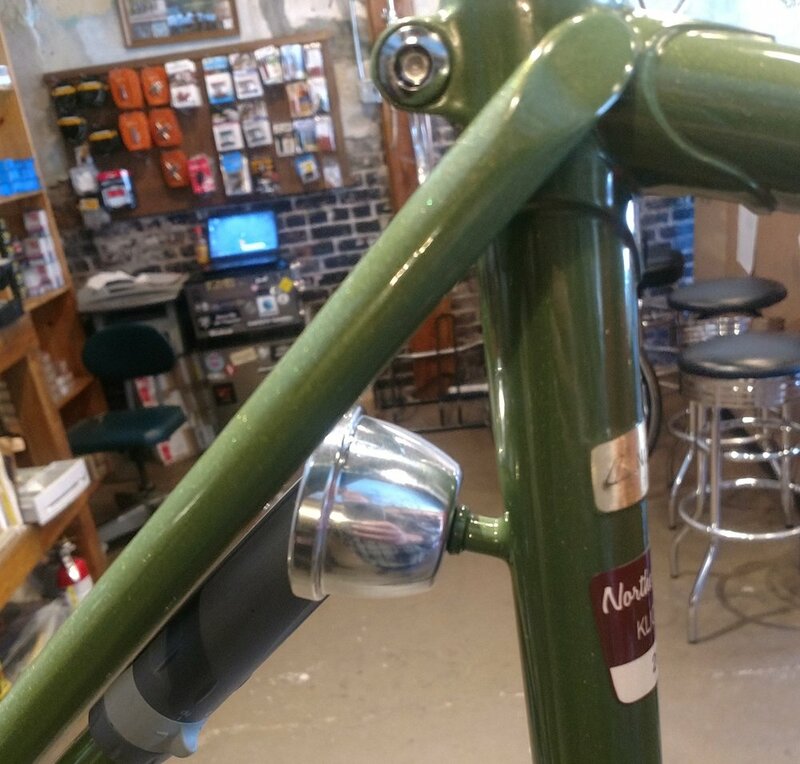 This keeps the wire tight and tucked out of the way of down tube shifters but allows it to stretch out while turning the handlebars/fork. So far the best method of adding the pig tale we’ve found is to tightly wrap it around an M4 hex wrench. While still wrapped around the wrench roll it in your fingers to pinch the wire into shape. Next gently add a little heat to get it to hold its shape a little better. This is not like melting the heat shrinking! The plastic housing on the wire is very easy to melt so no direct contact with the flame. Next take the excess wire you’ve cut off and add a female connector to one end. This is similar to doing the male connector. Except instead of heat shrinking the whole thing you need to leave the tang exposed so it can plug into the female connector. Now you can add a female connector to the other end of the wire. Run the wire to the headlight first. Cut any excess off and then add the male connector. If your headlight uses a different connector for the tail light wire use that connector instead. Plug your taillight wire into the headlight, install the dynamo front wheel, plug it in and give it a spin. You should see the taillight light up and be very bright. If the tail light does not work, or is dim you will need to double check your work and make sure everything is plugged in and the wire is not damaged anywhere. If some of the housing is scraped away from the wire and that exposed wire touches bare metal it will short to ground breaking the circuit and causing the light not to work. We’ve also noticed some headsets, especially expensive sealed cartridge bearing ones that shall remain unnamed, can cause a disruption in the ground and make a light not work or be dim. 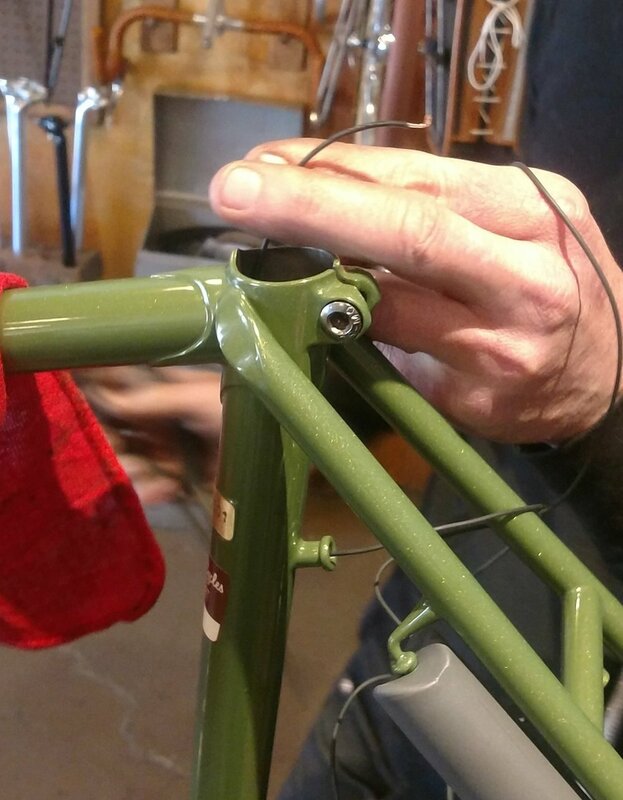 If you’re experiencing either of these problems use the brake cable and touch it to the light and a few bare metal spots forward of the headset, such as a front rack bolt or the bolt used to attach the headlight. If the tail light comes on you know you have a ground problem and will need to replace your headset, or run a ground wire past it. Some headlights also have a ground wire that will need to be attached to something. Son makes a connector that attaches to the wire on one end, and is a washer on the other end so you can run a short wire from the ground on the headlight to a bolt. I usually attach it to the bolt that holds the light to the rack/frame. Some fender mounted taillights need this done too. If neither of these tests work you may have a faulty light, or hub. I hesitate to even mention this as a possibility as it’s very rare and unlikely, but most people will jump right to this conclusion if there is any problem. It’s almost always a grounding issue. Play with a brake cable to check the ground. .
1. This should really be done with the special Knipex Crimper pliers made just for this. But at $267 a pair we don’t blame you for not buying them. Especially if you aren’t planning on doing a lot of wiring jobs in the future. 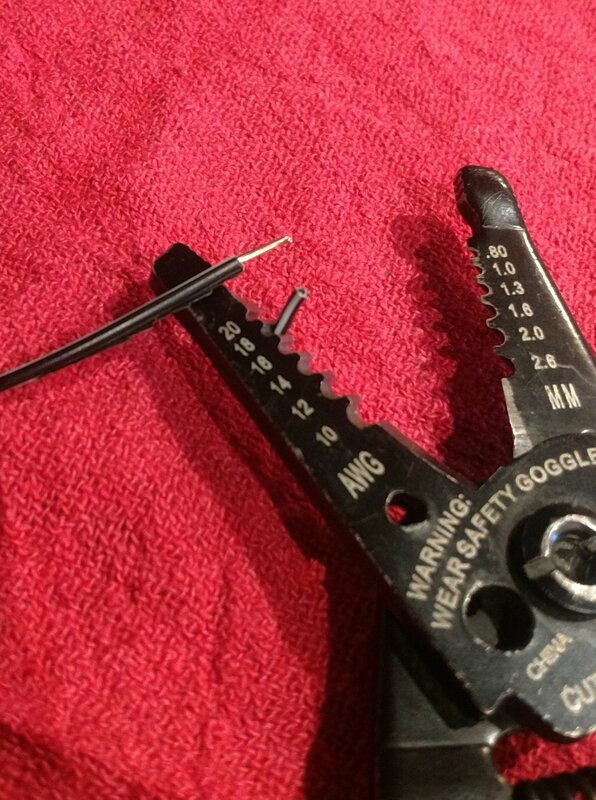 Instead you can carefully crimp the connectors over the wire with small needle nose pliers, but they won’t stay attached when any force is applied such as unplugging the wire. You’ll also need to solder the connectors from to the wire before heat shrinking. This isn’t fun, especially when the wire is in the bike, but soldering irons are cheap and there are lots of instructional videos on the internet. So don’t bug me about it. 2. You can use a bent spoke or wire for this too, but pliers work best. We’ve also read about a zillion other ways to fish the wire through the frame and tried most of them. 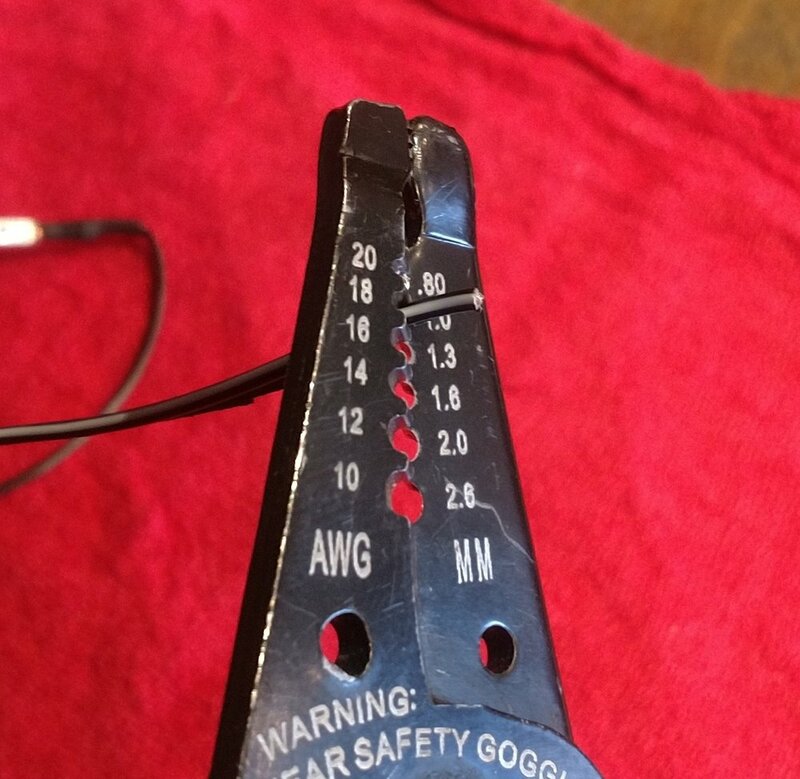 We’ll never do anything other than use an old brake cable heat shrunk to the wire ever again! 3. There are a few tricks to avoid having the cable and wire come apart while pulling them through the frame. First, don’t skip using rubbing alcohol to clean both the end the brake cable and the taillight wire. Second, don’t fully overlap the taillight and brake cable under the heat shrink. 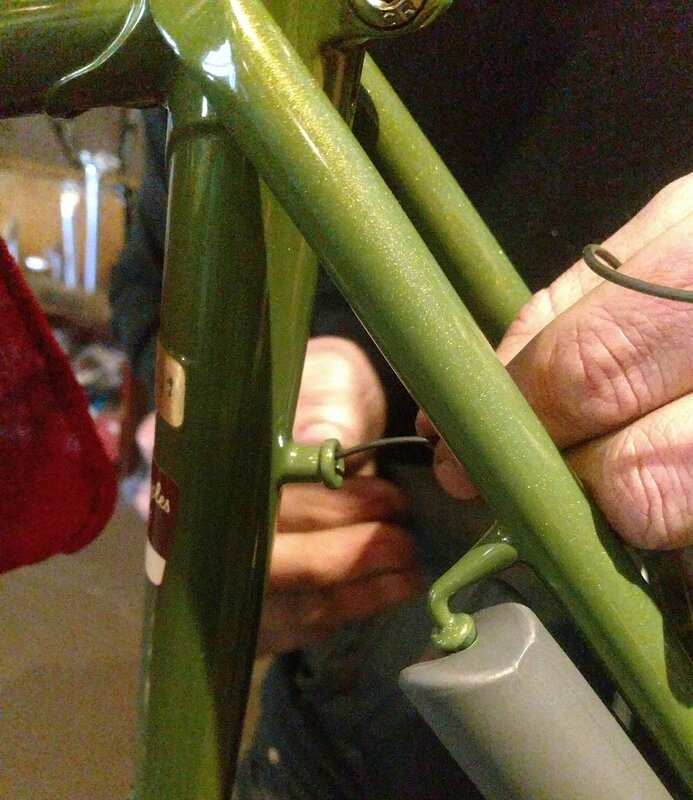 You can have the brake cable poke out a little, but don’t have the taillight wire poke out. You really only want it about ¾ of the way under the heat shrink. Also don’t have much, or any of the taillight wire be exposed from its protective plastic housing. The bare wire is slick and will pull out of the heat shrink, the plastic housing grippes much better. 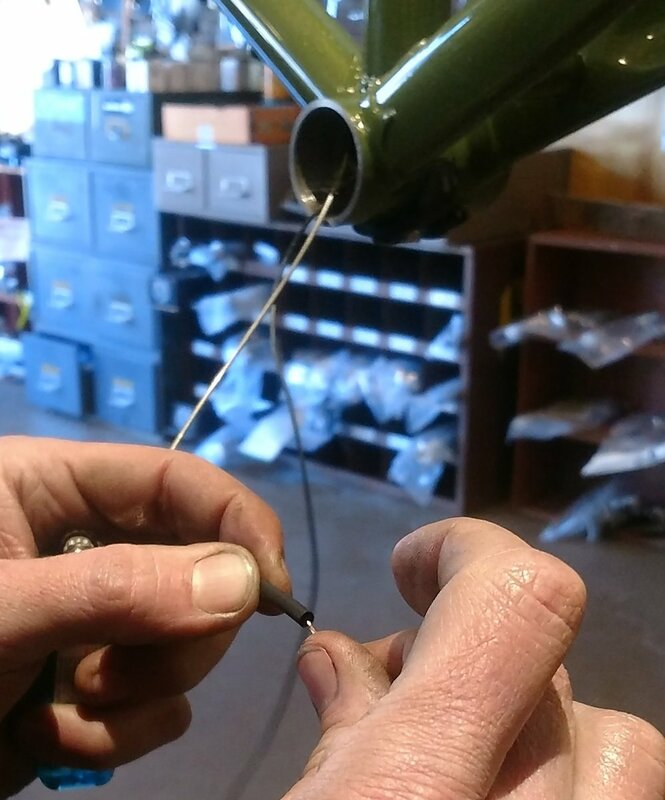 Third adding a little bend in the end of the cable can help you aim it by twisting the other end in your fingers. You can solder this joint, instead of using heat shrink, if you have trouble getting them to stick together while pulling them through the frame. 5. You don’t “need” to add a split here, but if you ever want to remove the fork for any reason you can just unplug the wire here instead of cutting it. The pig tails can unwind as well and it’s much easier to wind them up with the wire unplugged here.